A vanilla iced coffee is bound to be part of your routine if you are a coffee drinker like me. I figured a simple homemade no fuss vanilla iced coffee ought to be shared. After all, it’s part of my life too, although I don’t go to Starbucks, Dunkin, and donuts or Mc Donalds for a vanilla iced coffee. 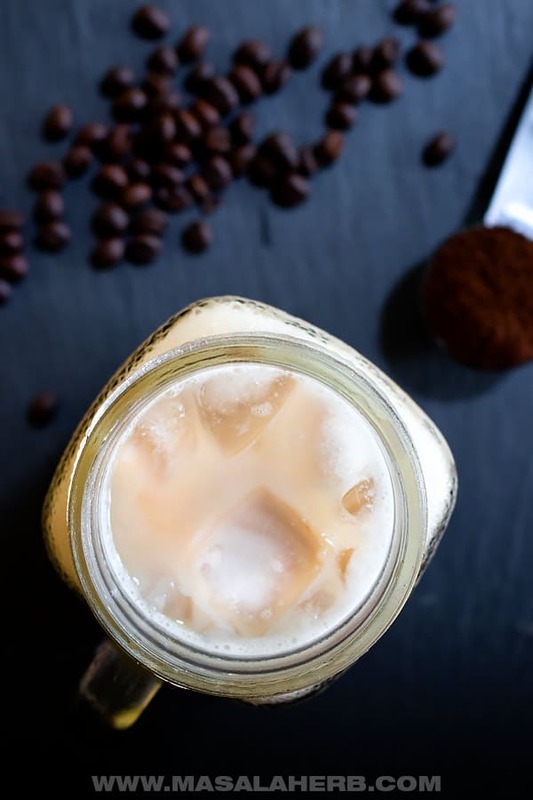 Further below I cover how to make vanilla iced coffee and share some more details and thoughts about coffee beans. Wherever you are in the world, your definition of iced coffee might something else and others might define it differently. The most basic explanation is, iced coffee is coffee with ice and milk. Then there are variations everywhere in the world. You can choose how to make your flavored vanilla iced coffee and to be honest there are no set rules. Just because Starbucks does it with their own vanilla syrup it doesn’t mean you need to do it that way only. In fact, I encourage you to try out different mixtures. One day you can try it with cold brew another you use up leftover coffee from the previous day. For example in central Europe, you will always see iced coffee prepared with vanilla and/or coffee ice cream. 2 scoops vanilla, one scoop coffee ice cream placed into an elongated glass and covered with cold filter coffee and some milk. To finish off, decorated with whipping cream and some coffee syrup. This is a heavier dessert like iced coffee version. Sugar is never added. Now, the following way is how I make mine almost everytime because it’s easy, effortless and I use up leftovers, which is another plus point! Basically, I can prepare this iced coffee within 2 minutes and it’s not too caloric heavy but completely enhanced with deep bourbon vanilla flavors. 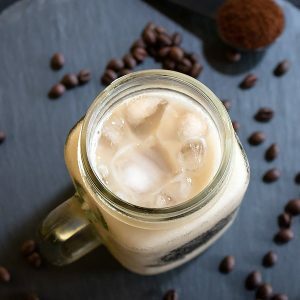 How to make iced coffee fast with vanilla flavor? First thing every morning, I prepare a big flask of black filter coffee and if something is left at the end of the day I place the leftover coffee in the fridge to store and cool. I think the coffee gains some flavors too that way. The next day I take out the leftover coffee from the fridge. Then I add some ice cubes into my glass pour the cold coffee over the ice cubes and add the sugar. I use powdered sugar to speed up the process and I add minimal sugar because I usually drink my regular filter hot coffee black. Regular granulated sugar won’t dissolve in the cold coffee so you will need to use powdered sugar or sugar syrup (sugar dissolved in hot water). Tip: You may want to use alternative sweeteners such as Stevia leaves. Then I use vanilla extract to flavor my coffee because you just need a few drops to add a bomb of flavors plus vanilla extract is without sugar. Alternatively, you could use vanilla syrup (Monin has a good one) so that would solve your sugar problem as well. Most of us keep vanilla extract in the kitchen for baking projects so I find it the easiest to work with to prepare vanilla iced coffee. You might want to check out different brands because some brands seriously have artificial tasting vanilla extract. Try these for a bourbon vanilla flavor. Another idea is to use powdered vanilla sugar which is prepared with real vanilla beans. These are common in central Europe and we either buy them in ready-made packets or we make our own by placing an opened vanilla bean into a jar with the powdered sugar which you need to share daily for a minute for 2 weeks. The vanilla sugar takes up the natural vanilla seeds and flavor. Definitely, this is the most flavorful and natural way to prepare a gourmet vanilla iced coffee. You will just need to plan ahead. So, once you have added the vanilla you are just left with topping up the whole beverage with cold milk. How much you add is left to you. I like a good amount of milk, some people suggest only a few Tablespoons, just enough to change the color. 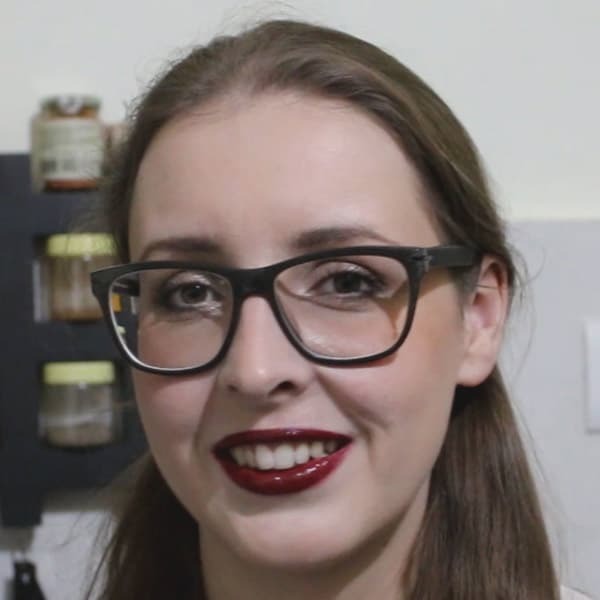 Using Filter Coffee – What coffee bean variety for iced coffee? 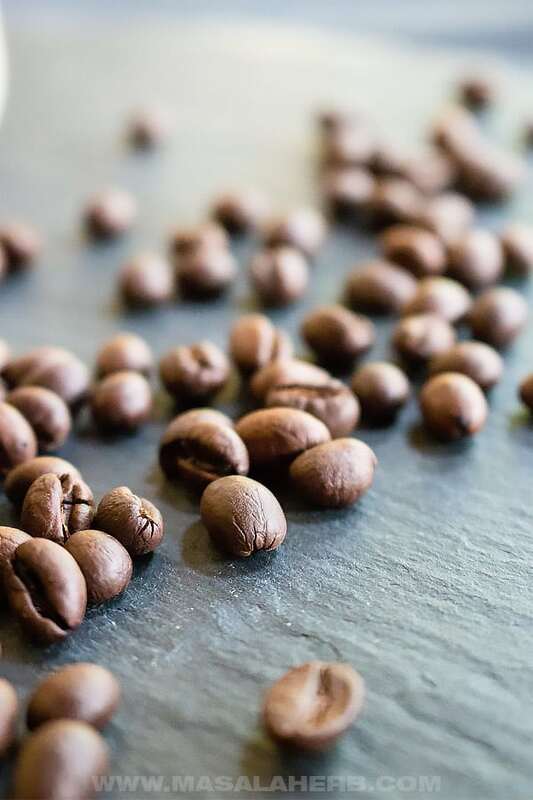 I am just going to brush over this topic quickly because we could talk a whole lot more about coffee varieties and things that dictate the flavor of a coffee such as the place of origin, roast, coffee storage, water temperature as well as the water ph rate. In this world, there are mainly 2 coffee bean varieties which survived all others for various reasons. Arabica is more common and Robusta is second. Arabica, Robusta both have sub-varieties and ost are very different in taste. Unfortunately, it’s not always clear which variety companies use in their coffee. Some will just mention a generic “coffee blend” description or some come up with the coffee crema label. It’s a guessing game. My coffee guy (yep I have a coffee guy) sells peaberry coffee beans (as seen in the pictures). It’s a strong spiced coffee which can wake you up instantly. The problem is the seller has no clue what variety it is because peaberry itself is not a coffee variety but just the name of a natural coffee bean growth occurrence. Peaberry coffee grows as a whole and not with a second bean to create the half/split effect. Anyway, when you pick your coffee, pick a variety that you enjoy. 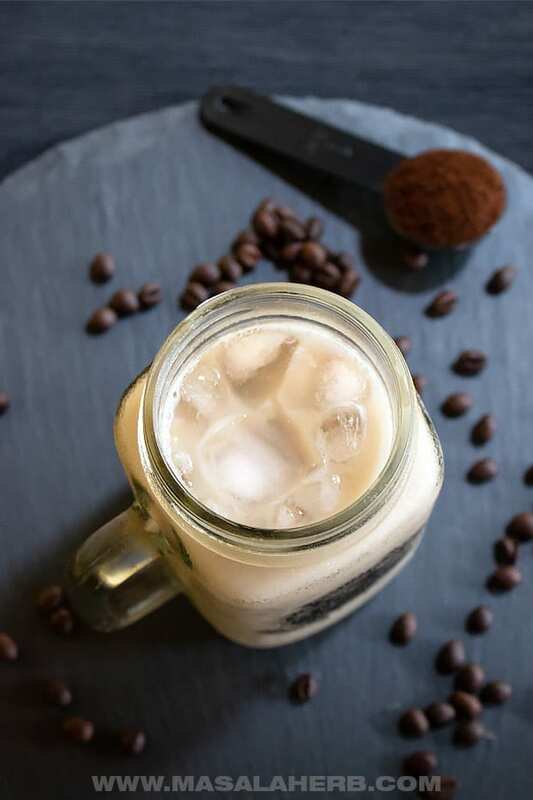 A stronger coffee can be perfect to prepare a great iced coffee brew because the milk and icy vanilla flavors can complement and enhance the flavors all the better. I have a simple inexpensive Melitta filter coffee machine which does the trick BUT I have been looking for a new one eventually because I would love to have a programmable coffee machine. Those prepare your coffee while you are still sleeping and you wake up with the smell of freshly brewed coffee. I think that’s super cool! By the way, I love these Clean Kanteen insulated Flasks. I keep my coffee in my black matt 1-liter bottle every morning and in the evening my coffee is still hot. The same goes for cold coffee just that almost 2 days later your iced coffee is still ice cold. 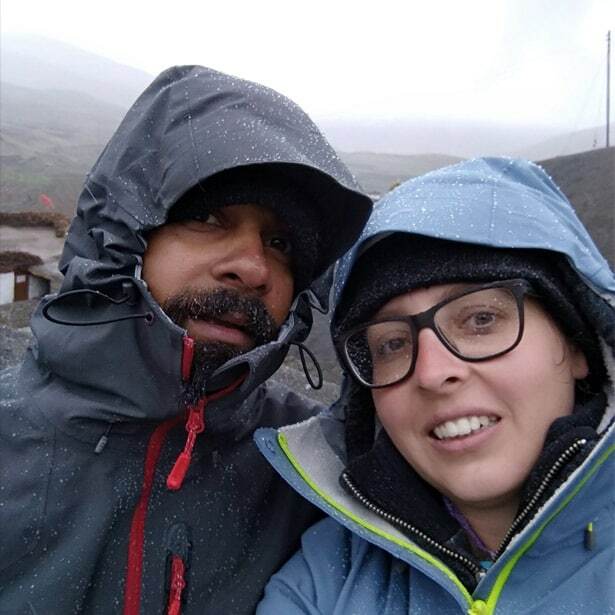 That flask even survived the Himalayas in the car with the worst roads ever, it’s super sturdy! I also use my Melitta Cone Coffee Filter no. 4 in brown because those give me the best result and that’s what everyone uses (since ever) in Europe. Check out these Vanilla extract flavors from Simply Organic and Watkins or this Nielsen-Massey Bourbon vanilla extract. Easy Vanilla Iced coffee, the fastest way to make this at home any time with leftover cold filter coffee. Vanilla extract, which you usually use in your baking can be used, a few drops, to add the ultimate vanilla touch to your iced coffee. The measurements are per glass, I use regular sized mason jars. For the Cold Filter Coffee, simply prepare coffee as you usually do and let it cool in the fridge until cold enough. This is great when you have a lot of extra filter coffee (work/college coffee insulated flask). 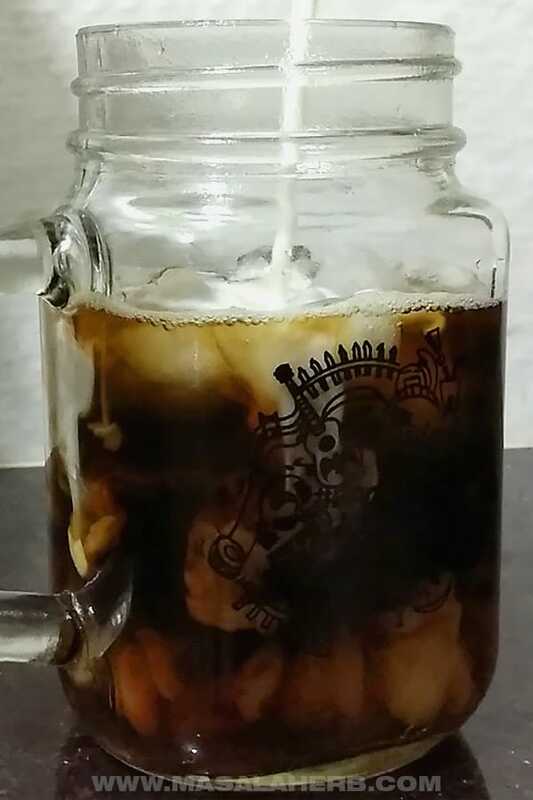 To make the easiest and fastest vanilla iced coffee simply add ice cubes to your glass, pour the coffee over the ice cubes 3/4 or 4/5 of the glass. How much you fill it up depends on how much milk you want in your iced coffee. Then add the sugar and vanilla essence and stir well. Top up with the milk and enjoy your iced vanilla coffee. Try different iced coffee variations by using cold brew coffee or whipped cream instead of milk. Using vanilla syrup or homemade vanilla sugar is another great idea! Dear Reader, what’s your favorite coffee variety? We don’t have leftover coffee because our Jura is a single serve, but I can certainly brew a cup and let it sit to chill. I love flavoured iced coffees particularly in the summer months, they are just so delicious and cooling.